Why do the hunting crowd go on hunt visits? Taking hounds to another hunt’s country is an opportunity to show off and have a party, says Adrian Dangar. 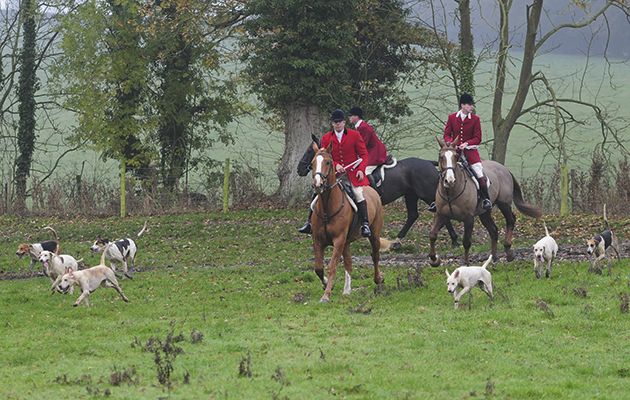 Tynedale MFH Charlie Shirley-Beavan and his hounds visit the South Shropshire. 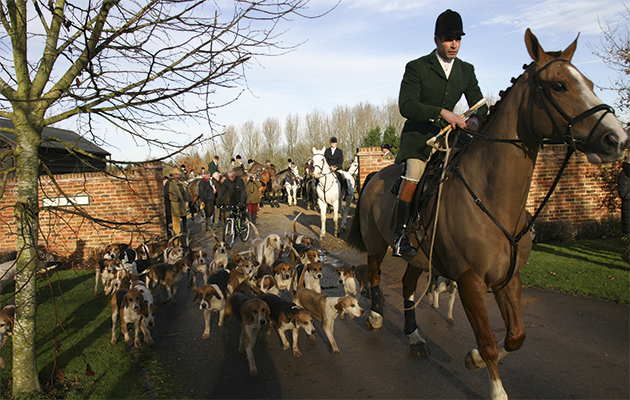 Hunt visits are becoming ever more popular, and not just to provide sport when the hounds start coughing. With the challenge of different country, the opportunity to show off your hounds and a party that runs the pub dry, more and more hunts are packing up their hounds and their horses for a sporting visit. Unfamiliar country almost guarantees the odd involuntary dismount, which can happily open the doors to hunting’s most exclusive society. Read tumblers club: falling, with grace to see if you could be next year’s top tumbler, or at least be invited to a cracking party. In the good old day when foxes ran straight and men still rode to hounds in scarlet, going on hunt visits to another hunt country rarely involved bringing your own pack of hounds, although there were some notable exceptions. In 1886 the Warwickshire pack travelled by train to hunt the Cottesmore country and were safely back in kennels by midnight having enjoyed a superb day’s sport. History does not relate how many Warwickshire subscribers were among the field of 450 riders, or how they reached Leicestershire, but hunt visits were to remain rare until the advent of affordable and independent transport. Return match: Four Burrow huntsman Nikki Hancock and her hounds in Heythrop country. Things had moved on a bit by the time of the late Captain Ronnie Wallace, who from the Fifties until his retirement as Heythrop MFH in 1977, moved his hounds down to Exmoor for several weeks’ spring hunting after the season in Gloucestershire had finished. If the Captain was an early pioneer of “have hounds will travel”, the concept of hunt visits was embraced by the following generation of amateur huntsmen including Ian Farquhar, Martin Scott and Alastair Jackson. More recently Frank Houghton-Brown took the Tynedale hounds on an annual visit to the Westcountry at the end of their season in Northumberland, kennelling them in a friend’s farmyard and hunting any country within striking distance that was good enough to have him. This went along swimmingly for several seasons, ending only when it was suggested that Devon might need a year off to recover. Surrey Union visiting the VWH. Thanks to the ubiquitous kennel cough, which can leave subscribers stranded without sport for several weeks, there are now more hunt visits taking place than ever before. For anxious Masters the solution lies in persuading other hunts to come and hunt their country, although there is seldom a shortage of volunteers. “My telephone was red hot as soon as word got out our hounds were coughing,” says Bedale MFH and huntsman, Matt Ramsden. “I wasn’t sure if the offers of hunt visits were due to a shortage of home country or genuine kindness.” For visiting Masters it was not only a chance to showcase their hounds in a different country but also welcome respite from the relentless grind of clearing country. There is much truth in the old adage, horses for courses, as Ian Farquhar discovered when taking his Bicester hounds to hunt across Dartmoor in the Eighties, without doubt the roughest and wettest landscape hunted by horse in Britain. “I made the terrible mistake of bringing our own horses, and on the first day had three falls in quick succession,” he remembers. “On the second day the Spooner’s footies put flippers on my boots at the meet and presented me with a snorkel.” Maybe that is why the Derwent contingent all arranged to hire local horses on their Westcountry hunt visits. Waveney harriers visiting the Bicester. When the Heythrop hunted the Four Burrow country their subscribers were confronted by wide Cornish banks. “A few tried to clear the whole thing in one leap,” Charles Frampton MFH recalls, “but most soon got the hang of jumping on and off. Our Cornish days were completely different and I kept thinking we were in a wild and woolly corner of Ireland.” Hunt protocol dictates hospitality should always be returned – or at least offered – and last February some 40 Cornish riders travelled north to support the Four Burrow hounds and their lady huntsman Nikki Hancock in Heythropia for a fun and successful return match. The late Sir Newton Rycroft, used to invite a different pack each year to hunt the New Forest’s unique terrain in order to assess their abilities and Martin Scott claims his Tiverton hounds were the first to catch a fox there in 1976, a feat he later repeated with the VHW. 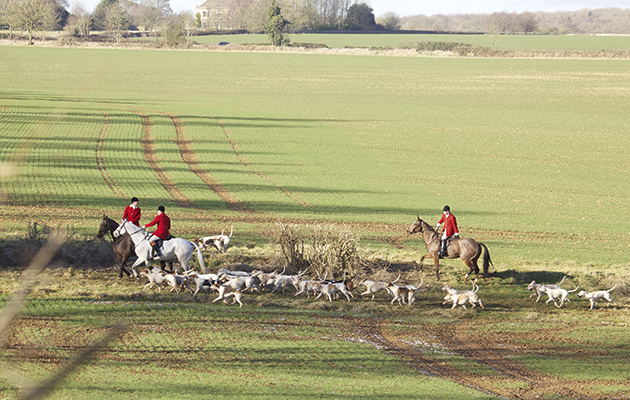 The current VWH Monday Master Julian Weston and landowner Lord Bathurst are similarly generous with the extensive woodlands of Cirencester Park, celebrated in hunting circles as being a true test of hounds due to the abundance of riot and thickness of cover. “I think it’s incumbent on hunts with plenty of country to help out the less fortunate, and we are lucky to be able to hunt into April here,” says Weston. “We had the Surrey Union up last year and don’t expect to go back. It’s fascinating watching different huntsmen and hounds – they often think the park is easy but it’s a lot harder than people realise” he cautions, branding one hunt “a total disaster”. I will remember my visit as Sinnington MFH in the spring of 2013 as one of the most rewarding of my career; 15 ½ couple ran hard for over six hours and not one hound even glanced at the multitude of roe, muntjac and fallow deer that criss-crossed the line throughout the day. The Ledbury in Pytchley country. They’ve answered several pleas for help. Hurworth Master and huntsman Joe Townsend, just retired from a long career in hunt service, was similarly delighted by the contempt his hounds showed for deer on a recent visit to the Woodland Pytchley, and by how well they drew coverts much bigger than they are used to. 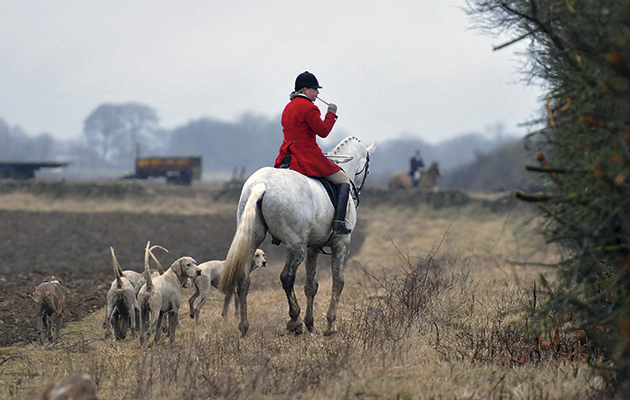 “For me the attraction of hunt visits is seeing how our Old English hounds perform in a different terrain,” he says. Farquhar’s celebrated Bicester hounds did not let him down all those years ago on their pre-ban trip to Dartmoor. “They relished having nothing to stop them across open moorland,” he remembers, “and I am particularly proud that in three days’ hunting we never lost a fox.” The Waveney Harriers were entertained by the Bicester – the first time ever the harriers had hunted away from East Anglia – and according to their Master “went brilliantly” – although they were somewhat put out by unfamiliar sheep netting and barbed wire. During my mastership of the Quorn we invited Edmond Porter’s Eskdale and Ennerdale fell hounds to hunt at Ashby Pastures in the Friday country. So far away from home, these lovely Lakeland hounds not only drew well but also hunted beautifully across an alien land until distracted by a plethora of unfamiliar hares. The future of hunt visits seem assured, not just because kennel cough puts many hunts out of action for several weeks each winter, but also because these exchanges are good news for hunting. It is important to stress the difference between invitation meets, where all hounds belong to the visiting pack, and a joint meet where both hunts contribute. With the exception of mountainous regions that demand the fell hound’s hare feet for effective sport, hunt exchanges have also dispelled the old belief that hounds must be purpose-bred for a particular country. According to Ian Farquhar, who has taken his hounds to hunt successfully all over Britain, “It’s been proven time and again that a really good pack of hounds performs well in any country.”.